Food Costs > How Much Does Almond Milk Cost? How Much Does Almond Milk Cost? Almond milk is a great alternative to dairy milk as it contains no cholesterol or lactose and is often consumed by those who want to avoid dairy products. 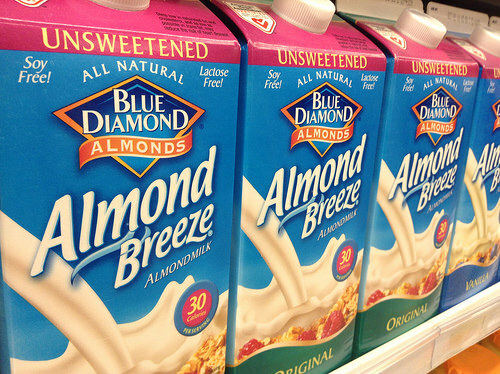 The cost of almond milk greatly depends on the brand, quantity and where you purchase it from. For a 32-fluid-ounce container, the most common container found at a local grocery store, it will cost about $2 to $4. For a gallon, the costs are closer to $6. At Walmart, for example, the prices for the top brands, such as Blue Almond and Silk, retails for $2 to $4 per 32-fluid-ounce container. Whole Foods, a grocery store we also checked out, had 32 fluid ounce containers for $1.99. For a container of organic almond milk, however, the cost was $3.99 for a 48-ounce container. This container, unlike the $1.99 version, only had water, almonds, salt and added minerals listed as the ingredients. Powerded almond milk, again, depending on the brand and retailer, can cost about $30 per one-pound container. Almond milk is created by blending almonds with water and then stirring the mixture to remove the solids. In turn, it will produce a somewhat nutty flavor with a creamy texture that is quite similar to that of dairy milk. Because of this, it’s a popular choice for vegans and those avoiding dairy products. Commercial brands do come in a variety of flavors, often enriched with minerals, protein and/or vitamins. Be sure to read the label to know, for sure, what the ingredients are. Is almond milk good for you? Absolutely. Almost as nutritious as dairy milk, almond milk is rich in several vitamins and minerals, especially vitamin E. It is also low in calories, doesn’t raise your blood sugar, it is dairy free, reduces the risk of heart disease, strengthens your bones and enriched milk is high in vitamin D, according to MedicalNewsToday. How long does almond milk last? When unopened, and as long as stored properly, almond milk should stay fine for up to three weeks, but to be safe, pay close attention to the expiration date. If unsure, check its smell and pay close attention to the consistency. If it looks moldy, curled and/or has a smell of spoiled milk, then it’s best to throw it out to avoid food poisoning. To store properly, always make sure it’s refrigerated, no exceptions. If left out at room temperature, bacteria can develop quite fast, spoiling it quicker than if it were inside the refrigerator. Popular almond milk brands, as seen in the table above, includes Silk, Blue Diamond, So Delicious, Elmhurst Harvest, Pacific Organic, Natura, Trader Joe’s, Whole Foods Market 365, New Farms and Califia Farms. If you are lactose intolerant, almond milk can be an alternative, but keep in mind it will have much less protein than that of milk. To save money, consider making your own almond milk as it is much cheaper than purchasing a carton at the local grocery store. WholeNewMom.com, for example, offers a very simple to follow recipe to help you save and notes, on average, you should spend about $1.27 for four cups, a savings of 48 percent. Gal on a Mission has a recipe as well. Recipes only call for almonds, water and sweeteners if you choose to add it. If you have a Vitamix, here’s a recipe as well. Buying in bulk can often drop the costs per container. For example, buying six quarts of Blue Almond almond milk can cost $0.06 per ounce instead of $0.09 per ounce on its own. Almond milk commonly goes on sale at most grocery stores, and in some cases, the popular brands also distribute coupons via social media and in the local paper.